At the beginning of the eighteenth century the Baroque period in art was ebbing as patrons favored lighter surroundings. From this a decorative trend emerged in a style that is called Rococo; a name derived from ornamental sea shells used as embellishments in architecture. Giuseppe Torretti (also spelled Torretto), from a family of artists, was active during this period but while working with other sculptors in Rome, classicism influenced his work. In the “Marriage of Sts. Mary and Joseph” shown here, Torretti presents relief figures in a Baroque-like theatrical setting yet the robes being worn are in a classical style. The subject of the marriage of Mary and Joseph has been included regularly in scenes of the Life of the Virgin but the story is not from accounts found in the Bible. It is mentioned in apocryphal sources which were compiled and included in a fourteenth century volume called the “Golden Legend.” In this account, Mary was living in the Temple and when she turned fourteen years old the priests decided it was time for her to marry. Young unmarried male descendents of David were sought to be her husband; Joseph, though older than the others, was included. All the men who qualified were asked to bring a branch and place it on the altar. The person bringing the branch that brought forth blossoms would be Mary’s husband. After the men placed their branches on the altar, the Holy Spirit descended as a dove and the one brought by Joseph burst immediately into flowers. Torretti places Mary and Joseph in the foreground kneeling at the altar and facing each other in front of a priest in a traditional Jewish ceremony. The bride and groom are barefooted as are the witnesses. Joseph is depicted as a bald headed man with a beard; he is holding a branch with blossoms in his left hand and Mary’s head is covered with a shawl. Because of damage from a fire several parts of the sculpture are missing; among them are the hands of the priest and those of Mary and Joseph. From a maquette (a small terra cotta preparatory sketch made by Torretti before carving this piece in marble) [click to view] we know Mary and Joseph were reaching across to each other and holding hands. The priest’s right hand was extended in a blessing. 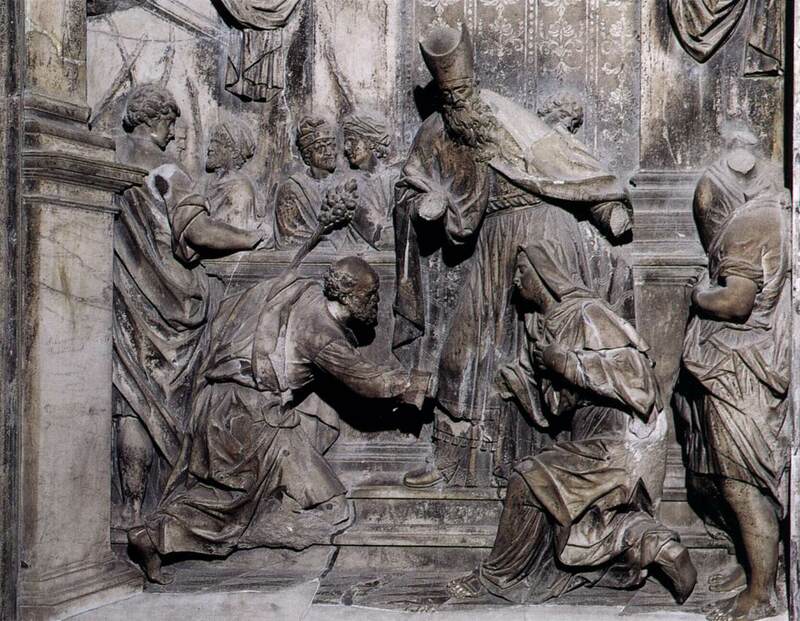 This relief carving of the “Marriage of Sts. Mary and Joseph” is in the dado of the Chapel of our Lady of the Rosary, in the Basilica dei Giovanni e Paolo (Basilica of John and Paul), Venice, Italy. A fire destroyed the Chapel in 1867 and the sculpture was discolored and damaged. Torretti’s maquette for this piece is in the Chrysler Museum of Art, Norfolk, Virginia. Very interesting, Hovak. Was any kind of restoration of this piece attempted? Here — http://bit.ly/19Ij5N6 — is another link to the description of the Terracotta study in the Chrysler Museum. Clicking the thumbnail opens a larger image of the study.